Strawberry Clan.... a term that is used in Taiwan to refer to those precious youth born in the 80's into small single child families. This is a generation that is born into a relatively affluent society where the pressure on survival and living is not as prevalent as during the more tumultous times experienced by our parents or grandparents. This generation generally demonstrates lower threshold for hardship and setbacks.. they bruise easily at the slightest pressure and wilt quickly in adverse conditions... fragile creatures that don't last well.... just like Strawberries! As I wondered what to do with the strawberries, I had been reluctant to pulp or puree these gorgeous fruits. I had wanted to keep the fruits intact without processing them too much. 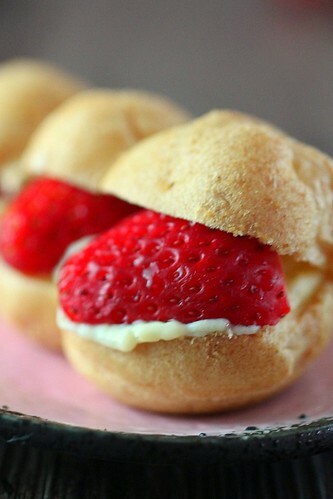 2 options came into mind : a strawberry cheesecake topped with fresh strawberries and/or a strawberry choux cream puff. I woke up this morning knowing that I no longer have the luxury to dither and opted for the very basic choux puff pastry and vanilla pattiserie cream. The whole puff was light and refreshing. I had deliberately chosen the butter free pattiserie cream from Bourke Street Bakery's Berry Tart. This was easy to prepare and the simple vanilla custard allowed the strawberries to take center stage. As I looked at the cream puff photos, I realised there was something 'bare' about them... then it hit me... I should have dusted a little powder sugar over the puffs... well, nothing's perfect but I am contented. 2. In a heavy saucepan, place water, sugar, salt and butter. Heat until butter is melted and mixture just starts to boil. 3. Remove from heat and add flour. Using a spatula blend flour with butter liquid until a dough is formed and is well mixed. 4. Return dough in saucepan to heat. 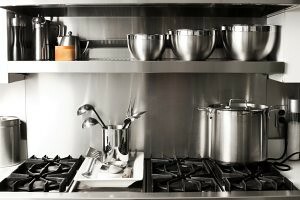 Continue heating and stirring dough to evaporate moisture. 5. Continue heating dough until dough becomes sticky and forms a thin membrane at the bottom of saucepan. 6. Remove from heat and bit by bit , add beaten eggs into warm dough and mix until well combined. 7. Using a piping bag fitted with a 1cm round piping tip, pipe 3 small rounds side by side on to a baking sheet. 9. Bake at 200C for 30mins. Cool completely and split 'eclair puff ' horizontally. 10. 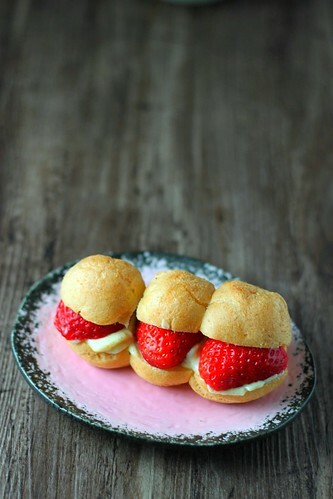 Pipe in custard (pastry cream) and garnish with strawberries. I have never heard of that term strawberry clan before! how fascinating :) Your strawberry puffs look so good and I was just gifted with some gorgeous strawberries that I could use! Beautiful photos as always! And the puff looks good and wonderful. Though I never tasted strawberries in Korea but those that I bought last week that NTUC imported from Korea were sweet and juicy. Now I am dreaming about your strawberry Cream Puff. I have yet to taste strawberries that I like. They are always sour. 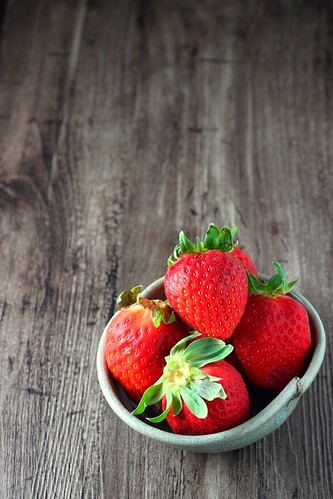 I went to a strawberry farm in England once somewhere in Kent eons ago but I cant remember what those strawberries tasted like..sweet or not....I was not yet a foodie obviously. The puffs look perfect Shirley and I LOVE the background! gorgeous shots!!! THank you for the Strawberry Clan story..I LOVE your woodgrain base.I have been coveting and looking..makes things look so good..not that your little puffs need it:) So cute ..
Lovely strawberry puffs you baked! Always inpress with the way you photographed your bakes! Nice job! i know, is cao mei yi zu in mandarin (: those puffs look so lovely and DELICIOUS! Is there a means of contacting you? Would like to ask for your advice on photography. looks really good! had not done puffs before will try it soon! 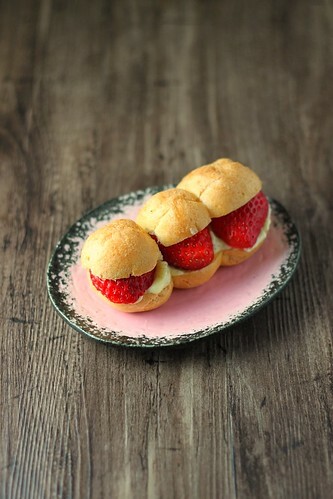 When you told me about the puffs through Twitter, I actually imagined choux puffs filled with strawberry cream. You were right not to puree them, that's the best way to respect such priced produce. I had some Korean strawberries topping a cup of panna cotta today and now am so tempted to go look for these sweet things at the supermarket. Gorgeous puffs and gorgeous photos, Shirley. My first (and until now, last) attempt at choux was a total flop! Hope to get a chance to sample your puffs one of these days. @NEL, the choux is one of the basics in pastry. It is not difficult...you probably made some wrong measurements. Try again!. You've made more difficult things so this should not be a problem. How pretty...! They look like little jewels! I love choux and I love the way you did them today. It took me awhile to figure out how they came about that term! SO beautiful. puff, cream and strawberry, life doesn't get better than tht. your photos are fantastic! 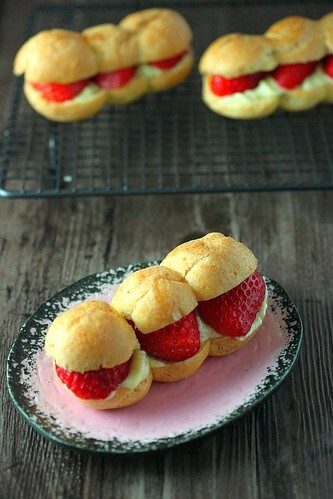 they are easily one of the prettiest cream puffs I have seen. Beautiful puff! Love choux pastry, daunting to make for me, co I love it from afar :-). Your pictures are gorgeous! Lovely shots, Shirley! 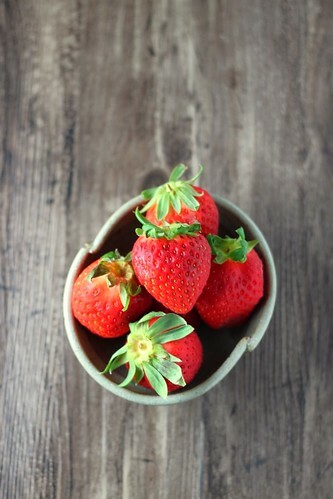 Really liking this background color against the red of the strawberries. And of course these look so tasty. CaliforniaGreekGirl loves strawberries...this is so creative and looks amazing!